When can we get our daughters ears pierced? I recommend waiting until children get their second DTaP (4 months)before getting their ears pierced. This immunization protects against tetanus, which theoretically can be introduced via metal objects. There are two good times in life to get your daughters ears pierced. Either have it done before 9 months or after 3 years old. 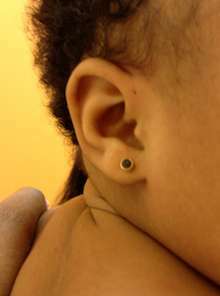 I fear that children between 9 months to 3 years will pull out the ear rings and swallow them.